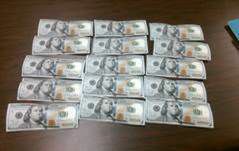 Counterfeit bills seized by a DPS trooper during a traffic stop near Alamo are seen. WESLACO — The Department of Public Safety seized 15 counterfeit $100 bills on Monday after a state trooper stopped a vehicle in Hidalgo County for a traffic violation. The trooper stopped a 2007 Chevrolet Tahoe going south on Tower Road in Alamo around 5:10 p.m. and discovered $1,500 in counterfeit bills hidden beneath the vehicle’s stereo system console. The driver, 24-year-old Esteban Soto of Alamo, was arrested and charged with third-degree felony forgery. He was later transported to Hidalgo County jail.